WhatsApp has revolutionised online messaging in many communities around the globe since it launched five years ago this month. To celebrate WhatsApp’s fifth birthday, digital marketing agency DPFOC, which services Canada and the USA, has created the below infographic celebrating the app’s journey from small start-up, through Facebook takeover, and beyond. 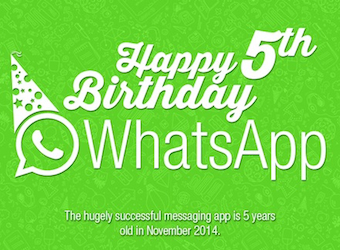 If you are yet to jump onto the WhatsApp craze, here would be a good place to start.